It is eight years since my last CD, Dogwood Place, which I recorded at the Sound Control Studio in Nashville with producer, Mark Moseley. With this new album I have had the pleasure of recording with musicians I have known and played with in England for many years. 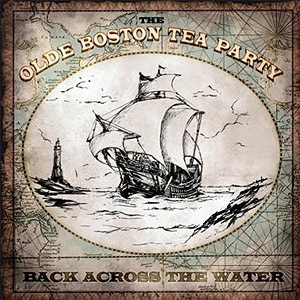 This album was recorded before the Olde Boston Tea Party had really been established and it includes David Hatfield and Jeremy Cozens, who are core members of the current band. It also includes dobro player, Ced Thorose, banjo player Chris Comac and fiddle player Nick Pynn with whom I have recorded previous albums. In addition I had Mark Fletcher on drums, famous for having been jazz legend, Ronnie Scott’s favourite drummer and, to give the album a Celtic feel, I had Will Flewett on the Irish “Uilleann” pipes on three tracks. I wrote a fairly eclectic selection of songs for this album, including subjects such as the tragedy in the Gulf of Mexico and the state of the British economy (“Days of The Long Shadows”) but overall I think this has ended up being a ‘feel-good’ album. I hope those who listen will agree. Recorded in 2010 – running time 49.49 minutes. It’s been quite a long time since we last heard from Charlie Boston and clearly the intervening years have been well spent – a variation on the name, an expanded line-up, a more varied approach to his music and subject matter, but still retaining that familiar and reassuring stamp of warmth and identity. I wouldn’t have wanted it any other way. It’s probably fair to say that British bluegrass acts struggle to achieve recognition where it counts but if there was anyone more deserving of broader acclaim then it has to be Charlie Boston and the boys. Gigging mainly in the West Country may limit exposure so let me give you the low down – Charlie writes all the songs, which are both contemporary or with a traditional feel. He also has a light but most engaging of singing voices, which is perfect for the musical form, warmly expressive and more than capable of capturing emotion when the subject deserves. The musical flow is simply perfect and notably supplied by the dextrous banjo picking of Chris Comac, the ever-wonderful Ced Thorose and his magic blues infused slide-dobro, the smooth fiddle of Nick Pynn and Jeremy Cozens’ decorative mandolin. It all sounds so effortless and this warm infusion dances and interweaves throughout the songs. Joining the band for this outing is the notable jazz drummer Mark Fletcher, while Will Flewett chips in with Uilleann pipes, which work particularly well on the slower and more ecologically minded songs, the most topical of which, Gulf of Mexico, addresses the recent disaster. What I like about this band is that they are not constrained by the limits of bluegrass and are quite happy to take risks and break free from its constraints in pursuit of variation. This stance is probably more evident here than on earlier outings – Steel Grey is an adventurous and funky jaunt, Days of the Long Shadows tips a poetic nod and a wink in the direction of the Celtic tradition, while Standards of their Fathers is pure folk song. Quite excellent and in every sense a feel-good album – welcome back Charlie. Following a string of seriously good albums, along comes another brilliant offering from Charlie Boston and his current top notch band The Olde Boston Tea Party. 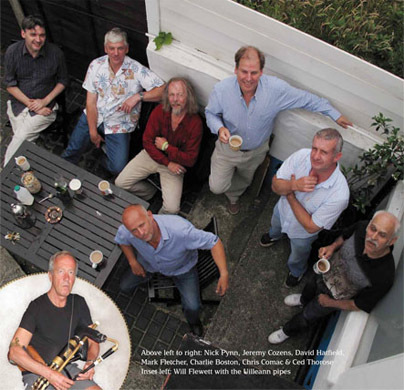 In this inspired collection of original material penned by Charlie, the band are reclaiming their Celtic connections and traditions in a bluegrass line-up that extends very tastefully to drums and Uillean pipes. The song topics are wide ranging as are the emotional reflections of the material. Charlie’s voice and singing abilities are classic bluegrass. His song writing is gifted and ranges from serious issues, happy themes to haunting themes . This highly original album is an utterly listenable and entertaining experience from seasoned and tight knit musicians. Highly recommended. “Back across the water” is the fourth album of original songs written by Charlie Boston in a musical genre which embraces folk and bluegrass. It has been an eight year wait for this album, performed with Charlie’s current band, “The Olde Boston Tea Party”, but it has been well worthwhile. Charlie has always been an innovator and with this new album he has attempted to show how American bluegrass music originated with British and Irish folk music. With this in mind he has chosen to introduce British and Celtic themes and instruments into what many might regard as the property of Kentucky. So we find a guest appearance by Will Flewett playing Uilleann pipes alongside Charlie’s long-time partner the wonderful Ced Thorose (Dobro), David Hatfield (bass/bass vocals), Jeremy Cozens (mandolin/tenor vocals), Chris Comac (banjo), Nick Pynn (fiddle) and Mark Fletcher (drums) with Charlie taking lead on vocals and picking guitar. The thirteen songs are so well crafted and so beautifully performed that I believe Charlie has indeed brought bluegrass “Back Across The Water”.